Howdy crackers? You know there is nothing called private in the world of the Internet. We don't like anyone spying us, whether they are ISP or other people. You might know about Facebook's Massive data breach which exposed 50 million accounts. All organizations and authorities are lying to us about protecting our privacy. We have to do something with it. Here we're gonna talk about a Kali Linux tool called "Noisy" which can protect our online data which mean a lot to us. We talked about many Kali Linux tools in previous articles which are great for hiding online activity but Noisy is a different tool. 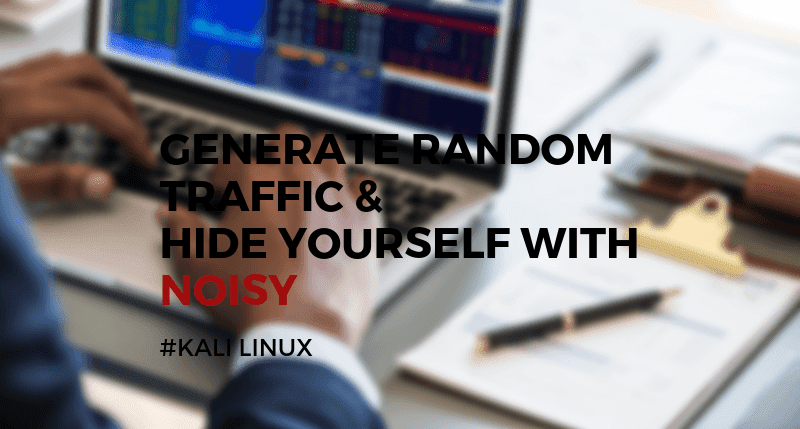 Noisy is written in python and it is used to generate random HTTP/S DNS traffic while surfing the web so that if someone spying on the system will lose the data in the crowd of random traffic. For example, we can suppress a normal sound by using a louder sound. Noisy works in the same way. But Noisy is not fully secured. Because the random traffic also includes the original traffic which can be traced. 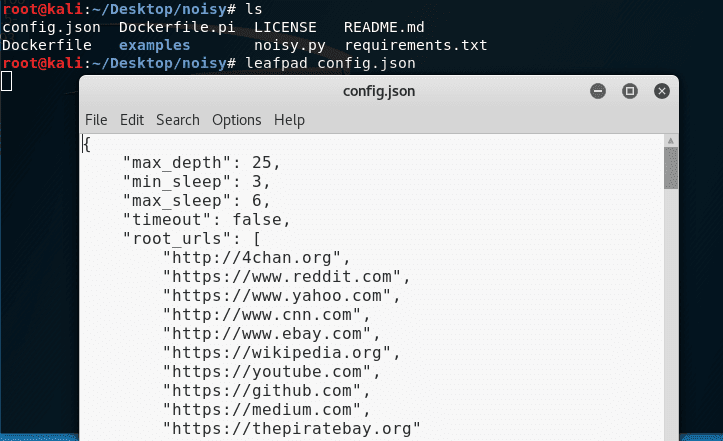 Noisy is compatible with MacOS, Linux and Raspbian Stretch but it needs python 2.7/3.6 installed in the system. It will install the files in the system. Now type clear and hit enter and again type ls to go to open the previous directory. Now you can configure the tool using the config.json script. Open the config.json script in any text editor. Here you will find many settings. You can configure what website will run in the background, max timeout etc. After configuring save the script and close it. Now we can use the tool. 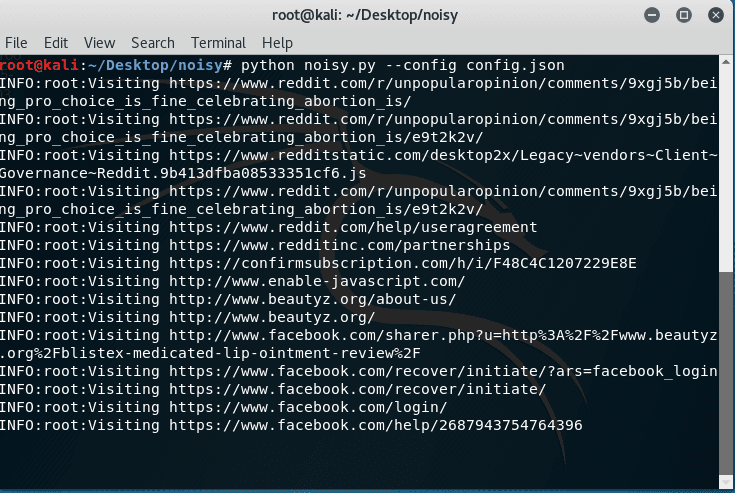 Before it, to check out the options we can use the command python noisy.py -h and hit enter. It will show the options we can use. congrats! the tool started successfully. Now we can use the tool without any error. It will start generating random traffic in the background and you can do web browsing normally. The random traffic will include the real traffic and the data will not be valuable for the person who is monitoring your system. Nothing is perfect. Noisy also has some cons. The original traffic can be traced but it helps a lot sometimes and in some situations. The father of the World Wide Web, Tim Berners Lee is working on a new concept called "Solid" which is a New Internet where we can protect our data privacy for real. we can control our data in our way. This is a very good thing for us. Read Solid- The New Internet Concept of Tim Berners Lee to know more about it. It is a revolutionary step of Tim Berners Lee and we should thank him for it. Hope you liked the tutorial and if you have any doubt feel free to ask in the comment box below. We are always here to help you. Have a good Hacking journey and don't get caught. Ta da!